It is official, as of today Jaaxy is NOW integrated into the platform here at Wealthy Affiliate! Jaaxy is Now Completely Integrated in Your Life. This has been something that we have wanted for quite some time. It makes much more sense to offer you as a member the BEST keyword & research platform (in Jaaxy) than to offer a much more limited tool. Jaaxy is now completely integrated for both Starter and Premium members. There is no more having to go to another site to login into Jaaxy as you are going to be able to access your keyword & research platform directly here at WA. With Jaaxy, the service at Wealthy Affiliate has been taken to the next era. There is also going to be no more confusion about the differences between the WA Keyword Tool, and Jaaxy. There is ONE keyword platform moving forward and that is going to be Jaaxy. To avoid confusion, I want to break down the membership levels of Jaaxy. We have kept 3 of the existing levels, with a brand new one that is offered to WA Premium members. Jaaxy Starter. This is your introduction to Jaaxy. 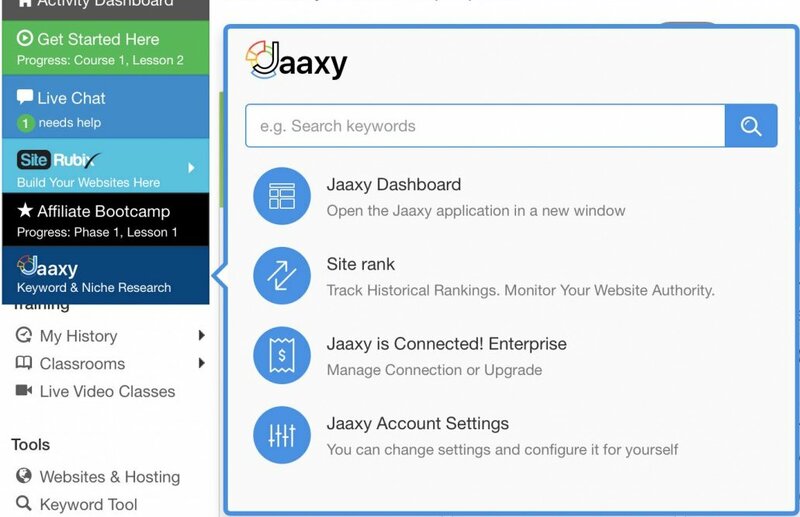 You can get a taste of the power of Jaaxy with the Starter membership along with some features ranging from the Keyword Search, QSR (Competition Data), Domain Search, SiteRank, Keyword Lists, and the Alphabet Soup Platform. Jaaxy Lite (NEW). This includes the same unlimited keyword searches that you have access to now with Premium and the WA keyword tool, but comes with some extra Jaaxy features like SiteRank. It is a much better tool, a much more polished platform and it is integrated into your experience here at Wealthy Affiliate now! Jaaxy Pro. This a powerful version of Jaaxy and the most popular. It includes unlimited access keyword searches, a much more robust access to SiteRank (to track your keyword rankings site wide). Get access to the Jaaxy platform in its entirety and operate at 2x speed. It also includes a larger subset of search results than Lite and introduces you to "multi-threaded" search functionality which is great for those that like to multi-task. Jaaxy Enterprise. This is for the elite affiliate marketer and internet marketers dream keyword research platform. It is the best value, but it is also the most expensive. It's great if you are an intermediate to an advanced online marketer, affiliate marketer, merchants, amazon sellers, and local marketers. It takes automation of SEO to a whole new level with SiteRank Tracking that allows you to automatically track your rankings in Google, Bing and Yahoo through the arc of time. This can be key for maximizing your SEO efforts and understanding what works and what doesn't. If you want the fastest, most efficient, and best value platform Enterprise is it. You will notice that Jaaxy has a new position within the main menu now. Upon clicking on that menu you will be able to open a sub menu and initiate a search from wherever you are at within WA. If you get a keyword or niche idea, you can instantly do some keyword research simply by cracking open the Jaaxy menu. If you are like me, you are constantly getting ideas and it is handy to have this quick and efficient level of access to the Jaaxy platform. You can also link directly to SiteRank to check to see where your website is ranked in Google and other search engines. This will take your keyword & research efficiency to the next level! For those of you with Jaaxy accounts already, connecting your account is going to be a breeze. First, if you are using the same email here at WA, we will check the Jaaxy platform for that email and match them up and allow you to connect your account based on that. If your account matches, you will see indication of this at the top of the Jaaxy page when you initially set it up. There are some circumstances where you may be using a different email account at Jaaxy, than at WA. If that is the case, you are going to be able to connect a different account at Jaaxy. You can do this by selecting "Connect an Account" from the main menu. You will simply enter your Jaaxy account details and then presto, it connects and you can use your existing Jaaxy account here at WA. If you are a Premium member and you have a Starter account at Jaaxy, it will automatically be upgraded to a "Lite" membership. If you have never used Jaaxy before, you will simply need to click on the Jaaxy link in the menu activate your account. You can choose the level of membership you want, if you are a Starter member, the Starter Level membership is free. If you are Premium, you will get the Lite version of Jaaxy included in your membership. And there Pro and Enterprise are upgrades which offer more features, more speed, more searches, more scans, as well as more platforms. Something to consider. A BIG Discount for Premium Members. Although Jaaxy is still a completely different product (and company) outside of WA, and a very popular one at that, you are now going to be able to access your Jaaxy membership directly through Wealthy Affiliate. You are also going to be able to upgrade to the Lite version (comes with a Premium membership), and also upgrade to the higher tier versions of Jaaxy with much more efficiency. But not just that, as a Premium member at WA you are going to get some BIG discounts on the Pro and Enterprise versions of Jaaxy. So we definitely have you in our best interest if you are interested in either the Pro or Enterprise memberships at Jaaxy, which many of you are already using and loving. We have you in our best interest, which is why we wanted to retain a lower and exclusive pricing discount for you as a Premium member of Wealthy Affiliate. Our Fastest Innovation in Keyword & Research Technology. We can now focus on ONE keyword research platform and this is going to lead to quicker evolution life cycles and we are no longer doubling the maintenance of operating two keyword platforms at once. We thrive on innovation at Wealthy Affiliate and figuring out new ways to improve technology and new ways to help YOU become more efficient is what excites us. Now that we have ONE keyword/research platform to focus on, you are going to find that it will evolve at a rate that you have never seen it. We have some incredible ideas for Jaaxy, some based on your feedback, some based on things we have wanted for a long time. There is a lot that can be done in the keyword & research space that is not being done, or if it is, it is being done really poorly. We are going to monopolize on these opportunities and continue to integrate "Jaaxy only" technology into the platform. Jaaxy in 2018/2019 is really going to be something special. We can assure you of that! Masterful Integration. It's Just Getting Started. There are many facets of your business that can communicate with one another, but conventionally they have never been able to. People have had the tendency to segregate their services, from hosting, to websites, to keywords/research, to analytics, to security, to outsourcing, to publishing content. However it doesn't have to be this way and we are going to continue to change the way business is done online. All of these platforms can and are integrated with one another, which can lead to them operating in unison and seamlessly. Your research, rankings, and keywords are now going to be able to interact with other elements of your business. What about being able to track keyword rankings instantly upon publishing content (or automatically). What about being able to initiate and write content directly from your Jaaxy interface. What about being able to research and buy amazing domains from right within the Jaaxy UI. What about being able to determine whether a keyword is a good one for your website. What about us being able to recommend keywords for you based on existing content. And 100's of more amazing possibilities that we will explore. This is what really excites us. No other platform in the industry has the ability to interpret and help you with efficiency in your business in EVERY respect. The introduction and integration of Jaaxy is just going to open up new opportunities to make your day to day activities integrated and speak to one another. Affiliates Stand to Benefit, Vastly. There are many positive impacts this is going to have on your campaigns if you are an affiliate of Wealthy Affiliate or just getting rolling with your promotions (through bootcamp). Better Retention. Better retention as a superior product and service is now offered here within WA. All Premium members have a version of Jaaxy to perform all of their keyword research, manage their keyword activities, track website/content rankings, analyze competition, and much more. More happy customers and more reasons to stick around, the longer people naturally do. Wealthy Affiliate is the ONLY place to be if you are an internet entrepreneur and we plan to keep things this way. Jaaxy integration was another monumental "quality" shift here at WA. Better Conversions. There are no longer going to issues with people joining "another" service. In lesson 7 of the initial OEC training people are sent off to Jaaxy to create an account because formerly free Starter members didn't have access to a keyword tool here at WA. Now the process is seamless and completely integrated. No more setting up "another account" to complete the tasks, it is going to be a breeze. More happy Starter members (and a more seamless process) will equate to more conversions. More Jaaxy Upgrades. Every single referral that you send to WA is now one of Jaaxy as well. This means that you will earn commissions on every single upgrade to either the Pro or Enterprise membership at Jaaxy. The Pro and Enterprise memberships are still available and they are better than ever. They are only going to continue to break new ground in the keyword/research space for internet entrepreneurs and subsequently there are going to be A LOT of people that will upgrade to the Jaaxy Pro/Enterprise levels. We expect this to be closer to 20%, whereas before it was around 10% of Jaaxy users. Not only is this going to have a positive impact on everyone's experience here at Wealthy Affiliate as our platform has just been taken to a new level of service, but if you are an active affiliate you truly are going to stand to benefit and it will positively impact your income greatly over time! There you have it. The cat is out of the bag, Jaaxy is here at Wealthy Affiliate and it is here to stay. This is a project we have been working on for a long time and it has been incredibly complex to integrate here, but it is now ready for the prime time! WA + Jaaxy + YOU = Success in 2018. I am a bit confused with the auto tracking scans in Jaaxy, it is saying that I have 0 scans until the 3rd October, we are now at the 8th and it has still not renewed and I am like Alex below in that I don't seem to have the Lite membership which has never been a problem before. Like Alex said, he was using the wrong email address to sign in. Did you also? Then I would put a ticket into SiteSupport . Hi Carson, does this mean that my WA referral who opened a Jaaxy account and upgraded back when she signed up to WA a couple of years ago, will finally be connected to my WA affiliate link? She joined WA through my link but when she opened her Jaaxy account something didn't connect to me and so I don't get the commissions. Haven't had any for as long as she's been a paying member of Jaaxy. Something like Jane Smith joined as a Premium Member of WA under me on 12 June 2017 (I got my commission on 1 Aug 2017), and she joined Jaxxy as a paid member on 19 July 2017 (I was expecting my commission on 1 Aug 2017) .... What's the story? Thanks David. This was looked into back when it first happened after a few messages back and forth between Kyle and myself. Something didn't work, they put it down to her possibly clearing her cookies when she signed up for Jaaxy. I was just hoping I might get the referral credits if they are now able to connect Jaaxy to the affiliates who introduced the members to WA in the first place. Apparently Jaaxy should automatically connect now to the WA member who referred them. I just thought I'd put it out there again to see if anything has changed for me. I'm not holding my breath, LOL. This seems like a really good (and logical) idea, however I have some problems here. Whenever I try to access Jaaxy I end up at a screen where there are three options: Free, Pro and Enterprise. From there I can not access anything. How do I reach the Jaaxy homepage from where I can do searches? Or the Siterank page? Whatever I do, I seem to end up on the page with Starter, Pro or Enterprise. It does say that my account is now connected to Jaaxy Lite. So how do I do this?? I am a little confused and would be happy if you could give me hand here. When you click on the dark blue button in WA that says Jaaxy, it brings you to a little screen. One of the options says that you are connected to Jaaxy Lite. Like you, I am connected to Jaaxy Lite. If when you click on the option "Jaaxy Dashboard" it does not bring you into Jaaxy (where the 'real options' are) I would suggest that you raise a ticket with WA support. When I do click at Jaaxy Dashboard I still end up at the screen with the three options. On top of it there are different options such as "help", Siterank, Account settings and soo on but when I click on any of these nothing happens so I think I might have to open a support ticket. I had the same problem but it resolved after a week. When did you merge the accounts? You can still search for keywords but not site rank until it's fully merged. I waited, not sure if you will need support or not. Before you can start using Jaaxy you need to create an account. So that's why you're ending up at the page with the 3 options. You are a PREMIUM member here at WA, so you can choose the LITE version which is included, or choose Pro/Enterprise if you wish to have more features with Jaaxy. Once you are connected, you will be able to use Jaaxy from within WA, or you can then go to the "Jaaxy Dashboard". But you can't do anything without an account and that's why you're being taken to the account connect page. Great, thank you, I will try that. The thing is, I already have a Jaaxy account and I have even tried to log in at Jaaxy.com but I still end up at the three options, starter, pro and enterprise. When I try to access from the Tab marked Jaaxy at WA it says that my account is connected and active. What can it be?? Raise a support ticket with WA Support as I suggested earlier. Based on what you were saying earlier, it sounds to me that there is some sort of technical glitch which hopefully support can resolve for you. However they can not sort if for you if you do not report it to them. Aha, maybe that is the thing. I only merged the accounts a few days ago, maybe it will fix itself like it did for you. I shall wait and see. Thanks, Carson, this is a wonderful gift. I have been using the WA Keyword Tool but now that JAAXY has unlimited keyword research plus upgraded other tools free for Premium members, it is my keyword tool of choice. As soon as my site starts making more $, I'll be more than happy to upgrade to Pro. And the future upgrades to JAAXY sound fantastic. One integrated platform to improve WA website performance, I don't Like This, I Love It. I'll be honest. The WA Keyword Tool worked well for me. I had grown used to it. Just connected Jaaxy Lite to my WA Account per your instructions and I can see it's going to work even better. I assume that eventually the Keyword Tool will be removed as a clickable option in platform side bar? Yes, the WA keyword tool will be removed sometime in January - we're working hard to bring even more integration to Jaaxy before then! I've said this so many times Carson that I'm starting to sound like a broken record ... you guys (you, Kyle and your tech team) are amazing. I get excited when you talk about the steady stream of platform upgrades and added features being planned. When they get implemented they always exceed my expectations and I'm quietly proud that I'm a member. I like you, had grown used to the WA Keyword Tool. I started to play with Jaxxy Lite shorty after Carson's announcement and was impressed with what I saw. Kyle actually released a new video yesterday or early this morning, showing more about how to use Jaxxy. Alphabet Soup Technique - 2018 Edition I have to say after watching the video, I am really looking forward to using this great resource, I played around some after watching the video and read again some aspects of this announcement from Carson. The difference between WA Keyword Tool and Jaaxy is like the differences between a Black and White Telly and a Colour Telly. Nothing wring with a Black and White Telly, however once you seen a colour telly, you will not go back to a black and white telly. Thanks Dave ... I'll be checking out Kyle's post Dave. What's a Telly? Slang word for television. Thought that it was a worldwide term. Yup ... a slang word for television per Google search ... a British word for television per the Urban Dictionary. I don't recall ever hearing that word here in Northern California, but then we spell colour differently .... color, lol. Aye, Scottish word for "Yes". I live in Ireland. We spell center as centre. We say petrol for gas. In some concepts gas for us, is another word for great fun. We also drive on the left hand side of the road, not the right. Normally we write dates like 21 December 2017 as 21/12/17, not in the USA form as 12/21/17. Can be interesting when the day element is 12 or under, like for example is 06/01/17 the 6 Jan 2017 or the 1 June 2017? One workaround is to specify the month as 3 letters, then there is no doubt, 6 Jan 2017 or 6 Jan 17. Fun and games for sure. The system says it found my account and connected me, but it still takes me to a payment page the requires PayPal ONLY. 1) I can't use PayPal's platform. 3) The "Jaaxy Help" tab has been inoperative for me and presumably anyone else who can't subscribe. What's the problem? Why won't Jaaxy address this problem, or Wealthy Affiliate do something to offer alternative payment? Is this a PayPal monopoly play example?? I just don't get it. Sad for me because I've had great success with Jaaxy. Why, why why??? You should be able to use Jaaxy Lite for free as a premium member. There's plenty of free keyword tools Belden. I have been using Jaaxy pro for over a year until PyPal cut me off... totally illegal to do that by the way, but they are too big for the Feds to control so now they are backed by the Fed and all Banking in U.S. Going to the moon soon? There is no way to contact Jaaxy unless you are already a member. Their support tab is TOTALLY inoperable. There's no way for me to reach Jaaxy, believe me I've tried and neither Carson nor Kyle will help. It's amazing. I've asked over ten times in different ways over the last 4 months since my credit card number on account was changed due to updating. Jaaxy is part of WA now I don.t have any issues with it and I am using PRO for more than a year. I checked and you can downgrade your subscription to a lower level. Go to your Jaaxy account and select downgrade subscription and you should be able to use Jaaxy Lite which is included in your WA premium subscription. You don't seem to understand that I don't want to use Lite. I am a subscriber for pro for over a year, but cut off by PayPal which makes my upgrade to new credit card impossible.... etc, etc. There is no way for me to even contact Jaaxy. Their "support tab" doesn't work for non-members. Thanks. Please let me know if you ever hear that the PayPal firewall has been removed from Jaaxy. Jaaxy LITE is included with your WA Premium account. If you wish to upgrade to Pro or Enterprise, there are now discounted rates for WA premium members. If you are wanting to upgrade within Jaaxy, we suggest upgrading here at WA where credit card and the discounts are available. You can manage your Jaaxy account at the link above here within WA. 2) I've been a member since 2016... until PayPal blackballed me for selling CBD to my patients. ... There IS NO opportunity to pay for my renewal without going through PayPal... which I have explained over a half dozen times to you and Kyle over the last 5 months (over and over) that people blackballed by PayPal cannot use any features of PayPal whatsoever. Let me be clearer: There is NO OPTION for me to use a credit card through a PayPal controlled portal. I've said that over and over again. I don't understand the problem I am having making a simple subscription payment. Will Jaaxy accept my payment or not? Sounds like you are in a bit of a pickle... very frustrating for sure. Your problem is with PayPal not with WA. The algorithms here in WA are set up for PayPal only (unfortunately). I am not a programmer so I have no idea how that could be corrected. If you have been disconnected by PayPal for selling an illegal substance according to their rules, then you need to straighten this out with PayPal. I do not believe Kyle or Carson can influence PayPal policies, and would not reprogram the platform here for one member. Best of luck in resolving this. I can imagine well your frustration, as I have have been in seemingly unresolvable issues before (not PayPal though) . Actually WA offers the ability to avoid PayPal for membership. Jaaxy does not. For the record, I was blacklisted for selling a product that is legal in all 50 states, prescribed by physicians, etc...CBD (cannabidiol). I help patients cure serious medical diseases, and I work with physicians often. ANy company that refuses to take cash or a personal check from a customer is highly suspect. Why do you suppose their "Support" tab is inoperable. Does that make sense that a visitor can't even ask for help? Wouldn't they want to help me renew my credit card information so that I could continue my Jaaxy Pro? What's wrong with this picture? Does anyone know who runs this 'company'? Amazing Carson and Kyle - the benefits of WA membership just keep on getting better - this is a huge leap forward. I have been planning to write a review of Jaaxy and this will make it even more appealing. Have just upgraded my account - Thanks a lot and Happy Christmas to you and your families. What should I be seeing when I click on 'get QSR' in Jaaxy Lite membership? When I click on 'Get QSR' the blue bar fills up and then does nothing. It just hangs out there. Should I be able to see the results of the "get QSR' with Jaaxy Lite Membership? When I tried it yesterday and clicked on 'get QSR' tI saw the results and both the 'QSR and KQI' fields were populated. Amazing, awesome, fantastic, excellent... what more can I say? Another great addition to already superb platform here at WA. I am truly very happy that I am part of this community. I may not be successful yet, there maybe bumps along the way.. but as you have said "this additional service will positively impact our income overtime". I am learning a lot and until now it has been impressive. Thank you WA, Carson and Kyle and the rest of the team for your sincere effort to help your constituents. Wow, you guys (Carson and Kyle) keep on surprising me, I'm so glad I found WA and have learned a lot since I joined. I can see the power of this awesome community and the work you guys do to keep it growing and evolving is amazing. We definitely will. Lots more surprises up our sleeves for you Jasser. Enjoy Jaaxy! As my question does not replied, I checkd it and I think it does not work for German Keywords. I know this is a english platform, but here are so many people from other countries and it were nice, that you consider this, please. English only platform at the moment, although other terms in other languages work if you use english characters, but we are definitely considering other languages. I tried some keywords on jaaxy and it shows me sometimes an simliar result like KWfinder. But sometimes it shows me a very different result. I also used only englisch characters. I think I can switch after 5 keywords (I can use only 5 a day for free on KWfinder) to jaaxy and tried it then on jaaxy too. That were great if you realized jaaxy also for other languages. Never heard of that tool, but we certainly won't be emulating that and they don't have access to the data or algorithms that we do, but if we integrate other languages we will be doing it right! Do you think if I use jaaxy for german keywords (of course with english characters), I will get correct results and I will rank (perhaps better than KWfinder)? Why I used KW finder, because I can add the specific language and the country, therfore I thought it is better and more accurate than jaaxy for other languages ..
You can test. They will be relevant traffic results and QSR if it does produce results. But don't worry, we are investigating and likely going to be releasing a multi-language version or capabilities with Jaaxy in the future. Carson, while I am still too new to fully understand the impact of Jaaxy, by just reading the comments of other WA members, I know that I have something wonderful to learn down the road. The support level here at WA is beyond noteworthy. Thank you offering me another tool to use along the way. No doubt this is a very smart move on your part and it should be of great benefit to us members; however, as a blind user relying on a screen reader, I will have to test the accessibility of the tool before I can fully celebrate. I'm a little concerned right now since not all of WA features are blind friendly, but, I shall be posting my findings soon. Blessings! It is something that we continue to work on and will continue to do so moving forward. Thanks Kyle, it will take me some time to explore my ability to use Jaaxy features, but, for now I can tell you I would definitely appreciate if the former WA keyword tool is not removed! Hope everyone is charged up and ready to go in this first week of 2018! Since I'm still trying to figure out if Jaaxy would work for me as well as the original WA keyword tool in terms of accessibility, here are a couple of concerns: I haven't found a way to organize the results, as in listing them from lowest to highest for example; and nor have I been able to save results onto a list. This are things I can do easily in the old tool, but, perhaps there is something I've missed, so feel free to make suggestions. Thanks! Fantastic! A few minutes ago I was trying out the old keyword tool. A great feature for marketing WA as a fully integrated platform. Third party tools are too expensive for starters. 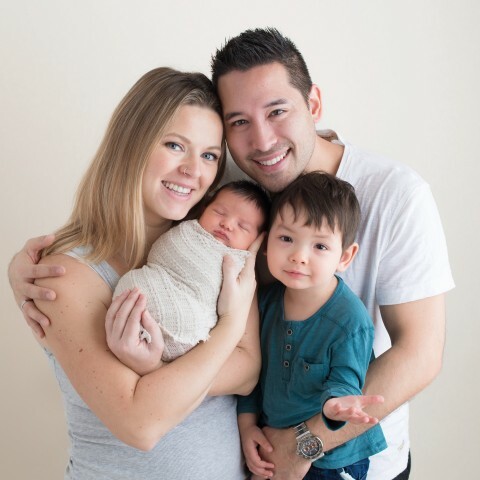 Welcome Jaaxy and thanks a lot Carson and Kyle. A wonderful new year gift that will ease our life as affiliate marketers in 2018. Well now you have full access to Jaaxy! Thanks Carson, I found out about this last night and of course went there and got the Jaaxy Lite. Have not tried it yet, my postings are usually Fridays and Sundays. So I will give it a try this week. One of the innovations you are or have integrated is being able to recommend keywords based on existing content. That would be awesome. Sounds good and yes, one of the innovations that you have mentioned is definitely one that we are going to be considering. You know what, I never said thank you. Thank you to Kyle and Carson for this!!! It looks so cool and has such a nice ease of use to it as well. Delighted. My initial reaction was = wheres all my saved keywords lol but now know I can export them. Thanks again guys you really are absolute best!! Carson, this is amazing and surprising for many of us here at WA and we take it as a Christmas Package. I really feel the pulse that you care your members and look anything available for their online success. The best part is that Free Members are allowed to access this awesome tool. So this is a history in the making. I have posted a blog on this mentioning You, Kyle and jay. You have added something incredible and must say that it really is a milestone to reckon with. We make decisions based on what would help people most, not what would make us the most money. Hence why we continue to improve the platform here at WA without any additional costs and we have retained our same pricing for the last 12 years now! We are really happy to introduce Jaaxy to the family. Yes, yes Kyle. This is a freaking awesome offer. Let's make our family the Best Internet Training Affiliate University which cannot be paralleled by any other company in the industry in terms of Cost Efficiency and Himalayan Support. Thank you Kyle, Carson and the whole working team. In the skin of a Christmas Man you are perfect. The joy, the fidelity and the success of the community should be our gift to you. You will need a big Christmas tree. Only one small question : I haven't tried it yet, but will it work for French too ? I am excited about this! I played with this a bit and found many of my website articles ranked on the first page of Google, with rankings in Bing and Yahoo as well for their main keyword. I can't wait to take a peek at more of the keywords I embedded into the articles to see how they are doing. Fantastic! ** Carson, did this date, 1970, mean to be on here on the bottom of the page? I'm pleased that Jaxxy is integrated with WA and I now have unlimited searches and a discount on upgrading, however, I'm not pleased that we will be losing functionality vs. the WA keyword tool. No ability to sort keywords by traffic/queries is a major disadvantage and will make keywords research more difficult and time-consuming. Keyword Sorting is the main reason I haven't used Jaxxy regularly in the past and I'm disappointed to see this basic and necessary feature is only available in the most expensive enterprise subscription. You must take into consideration that some of us actually pay for Jaaxy and if you give it too much for a premier member then the likes of me and others will stop paying for Jaaxy. Of course, I totally appreciate that hence why I'm not asking for anything over what was offered previously to WA premium members. Not unreasonable and simply good business not to take away features from existing customers. At the time I signed up for a Wealthy Affiliate Yearly Membership I had access to a keyword tool that gave me 100+ search results and the ability to sort keywords. Less than a month later the WA keyword tool is no longer working for me and so this change to the WA service has actually made my experience worse. I don't think this was the intention of Kyle and Carson as they have worded this announcement as an improvement to the WA program!! So either they need to retain the WA keyword tool (which Carson has stated is a duplication of their efforts and holding back development) or make sure that the Jaxxy Lite membership is as good as the WA Keyword tool was. There are plenty of other benefits to Jaxxy such as faster speed and automated QSR, you have signed up for premium Jaxxy when these features were available for free within WA so it shouldn't make you stop paying for Jaxxy if they are still free. As I mentioned, I pay for Jaaxy and am more than happy with what it gives me and for so little a price. Leaves, other more expensive keyword tools behind in so many ways. I still use the Free Keyword Tool and don't wish to see this taken away. The reason being is that this Free Keyword Tool allows me to sort by columns, and whilst Jaaxy will do the same, it will only do the same if you pay for the top level membership which I don't. If they change the Jaaxy middle membership to do that then I am a happy person. So please leave the Free none Jaaxy keyword alone! I can't see this getting removed anyway because there are too many people who rely on it, but if they do then I will cancel my Jaaxy membership. I agree keeping the WA keyword tool is one solution but I think they are planning to remove the free keyword tool in WA in favour of directing WA members to Jaxxy. Carson says in his post that they are only going to maintain ONE keyword tool meaning Jaxxy only. At least that is my intepretation. Hopefully there will be some clarification. At the moment it looks like going forward only Enterprise Jaxxy members will have the ability to sort columns. This is a loss of function for WA Premium members including Pro Jaxxy users such as yourself as you have described. I'm so happy that they listened and have already made changes so you can now sort by keyword results in Jaxxy. Fantastic! Definitely onboard now and excited to get using these early Christmas Presents from Kyle and Carson! it will work because the keyword tools is fetching data on search engines then give you an output based on the option you choose. let's say something is looking for something, this can be in any language. The keyword tool will fetch the information needed. It should work on normal circumstances. Wow! Thank you Carson and the WA team for this wonderful advancement! Having Jaaxy integrated seamlessly within the WA platform is a BLESSING - being a Jaaxy 'heavy user' I can see how much time this will save me on my workload! And this is work that every milli second counts...!! Looking forward to discover more of your surprises in 2018! Does this mean that the old keyord tool will no longer be supported? With the 25 search results for the free version - will it only sort on these or on all results? I'm in the same boat, with limited search results and no keywords sorting this feels like a downgrade. Anyone else throwing up errors when searching keywords with WA too? I hope it has not already been discontinued. WOW! What a great Christmas present. Thanks Kyle and Carson. You state above, "Every single referral that you send to WA is now one of Jaaxy as well. This means that you will earn commissions on every single upgrade to either the Pro or Enterprise membership at Jaaxy." Does this mean that every premium member is now an automatic affiliate of Jaaxy like we are of WA? If yes, what will the commissions be for a referral upgrading to Pro or Enterprise? In addition to that, what if a non-WA member signs up to Jaaxy through my affiliate link but does not become a member of WA, would to commissions still be the same? To track commissions from Jaaxy, will there be a separate page for those commission stats? Good points Robert, I would think as Jaaxy is still a separate platform all the tracking and referrals would be on there. Interesting to think that any WA sign ups are also Jaaxy Lite users instantly and possibly can upgrade at any time. This is mindboggingly exciting news! Thank you so much! Just in time for Christmas and my B-day :) Although Jaaxy was a great product before and the value of the WA offering in itself is tremendous, there is always a degree of bitterness when you are in a premium program and there are upsells that seem inevitable. I do believe this is going to increase your conversions greatly as well :) Happy Holidays to you all! Oh yes, I agree, will eat ice cream to celebrate! ;-) Congratulations on your B-day! May 2018 be an outstanding year for you! Thank you thank you thank you! Happy Holiday Season, Many Scoopies of Yummy Happiness and prepare the IceCreamLaunchers for 2018! Let's shoot for the stars! OK so I know everyone likes Jaaxy but I really didn't mind the WA Keyword tool. It worked just fine for me. Now I see that I can not click the "Avg" or"Traffic" and have all the keywords in order based on number of searches. So is this a feature that is now only available if I up grade? Also, does this mean that I will not be able to do any Digg -ing in the old tool? I tried to do a search and I also tried to digg and it says Oops, we couldn't find any keywords, try your search again! Instant sort is something that is available within the Enterprise membership as this also includes instant QSR, domains and KQI results as well. You can DIG, simply by clicking on the keyword itself and it will do initiate a new search on that keyword. Your old keyword lists can be downloaded still within the WA keyword tool, but moving forward you will be able to build out new keyword lists within Jaaxy. The old WA keyword tool is going to be sunset. Hope this helps you out here. OK Thanks for the clarification Kyle. All is good! Kyle & Carson & WA team, thank you so much for this amazing upgrade, this is the very best thing that you could accomplish for the WA members, because Jaaxy is a very good keyword tool. And now I don't have to wait ages anymore to make the QSR pop up (this went a bit slow with me in the keyword tool of WA, but that can be caused by my computer as it's not very fast hahaha, it's an old laptop). Having it integrated into WA and having the quick search option is going to save you a ton of time and is going to lead to a great deal of "on the spot ideas" actually getting researched. And the integration process is just getting started. We have a lot of stuff to look forward to moving forward. Carson and Kyle, it's going to take a whole day for you two to read all of these accolades. I can feel everyone's excitement clear through my screen! Thank you so much for your concern for our welfare, your support and the wonderful community you provide us, and the opportunity and training to grow and prosper within the internet marketing business. And now adding Jaxxy to the mix! Just when I think it can't get any better than this, you surprise me yet again! Merry Christmas to my two heroes and your families. We read them all, the community here is what makes WA and all feedback is important to us. Kyle and Carson - a BIG thank you - it is very much appreciated! Cheers and congratulations to the two of you on this latest innovation! P.S. Oh, yeah...Happy Holidays to you both and your loved ones! I know you are really going to love Jaaxy and it will become your go to tool, just a matter of time. I hope you have a wonderful holiday season ahead as well Dave! First thanks, Carson & Kyle for this great hookup! I had a pretty good idea this was the big surprise when the WA KWTool went down the other day. I do have a few questions. I tried out my good ranking pages and keyword according to GA and I am not getting the same data. What Jaxxy is telling me is not even showing up in a Google search. the stats that Jaxxy is giving me as Page 1 position 3 but I can't find my page in 20 pages of SERPs. Also, the ranks that Jaxxy is giving me doesn't match other tools I have referenced against. Is Jaxxy an average of results rather than direct results? Now that is only Google SERPs and the YAHOO and BING are bang on what I get with my other tools. So I double checked there were no manuals or violations with Google and that all checked out too. So how come the Google SERPs are the only info that is coming back different, any ideas? Am I doing something wrong? I didn't use Jaxxy as my regular tool so I am getting used to it now. I do love how it's integrated into the WA now, that is super cool and may make me switch to Jaxxy fulltime if I can figure this issue out. Will you please--please--please--stop requiring add-ons that mean my having to spend more money beyond the $49 a month that I am already paying! I can't afford yet another $49 a month or even $19 a month unless I begin to make sales immediately, and I don't expect that to happen for awhile yet. Is the free Wealthy Affiliate keyword tool still available? Please say that it is. What they did was the opposite of that. You can now use Jaaxy Lite as part of your premium membership. Also, I checked and the WA tool is still available. PMurray. The chart shows you are a Jaaxy Lite member now. Free and a definite upgrade for free as a Premium Member from the original KW tool. Unlimited free kW searches...hope this helps. It is our Christmas Present from Carson and Kyle! I LOVE that you've done this! No more having to go to Jaaxy separately, it is now here at WA. It is just simply amazing what you all provide us with to ensure that we will be successful, it is now up to us to use the tools and resources you've provided so that we can reach that success. Thanks to both Kyle and Carson for integrating Jaxxy into WA benefitting us all in the process. I was just looking at Jaxxy Help and I discover 3 bonuses which are available to download. 1,000 High Traffic, low comp keywords, plus niches, keywords success and number 3. Domain industry secrets. Its a candy store for affiliate marketers. Thank you Carson and Kyle. This is awesome! And thank you for keeping the prices down for the premium WA members! It is so wonderful that you, guys, are full of ideas. You are excited, and so are we. Many-many thanks to you. I am really glad that I found and joined WA. Another question about the affiliate side of this... I’m unclear what a Starter member will get when they join, it doesn’t sound like Lite, so they will get Jaaxy Starter I assume. On live chat, I was telling Kyle about me getting Jaaxy referral emails at the same time I’ve been getting WA referrals in the last 24 hours, and he said this is incorrect or needs to look into this? So what does that mean, do we not get those referrals after all? Also how would a brand new WA Starter know to connect to Jaaxy? Will there be a funnel for them to go connect with Jaaxy in the lessons? This will outline the different membership levels and what you get and when a Starter member connects their account, they will see this grid and choose the membership that they want. Thanks! That’s great to hear Kyle. How about those Jaaxy referrals I got in the last 24 hours when my referrals signed up here at WA, do I get to keep those? I received Jaaxy referral emails too when I got WA referrals, at the same time. Yes you keep those because these are people registering to jaaxy by connecting their wa account (that weren’t jaaxy members before). I've had to use the regular WA keyword tool...only making $$ from my few referrals right now. Hope to change that in 2018!! Great news!! THRILLED!! Ready to move forward in 2018!! Happy with the Lite version for now till I get going and can upgrade. I LOVE WA..and hope to bring more amazing ppl on board!! Thank you soo very much Kyle and Carson...you make building our individual businesses a dream come true!! This is awesome! So much easier when working on research. My Pro account connected without a hitch. Thanks guys! So glad to be part of a quality platform like this. Can't imagine the amount of work going on behind the scenes. You all Rock! Now that Jaaxy has been integrated into WA would we also be able to use a Jaaxy affiliate link as a backdoor entry into WA? I ask this because you provide a affiliate link to build a free website with siterubix and it directs us to WA when typing in a domain name. Just wondering if this is possible rather than just promoting Jaaxy By itself. Woaaaaa, incredible, exactly what I was asking for a few days ago, it's even better than what I've dreamed of. Now there's no excuse for me for not going yearly, then in few months when I will be more comfortable with SEO, I would consider upgrading Jaaxy. One question, for the Enterprise subscription, what do you mean when you said it's also good for Amazon Seller? I'm very interested in this option. If you could get a tool like JungleScout at WA, it would be a must, but I understand this is not really the goal of WA, just a suggestion. Anyway, the Jaaxy upgrade is just Amazing, really like WA more and more. BUT, we are not about today, we are about tomorrow! It is indeed great news, exciting news, for all the other reasons mentioned in this announcement. I am happy the old keyword tool is gone in favour of Jaaxy integration, well done! 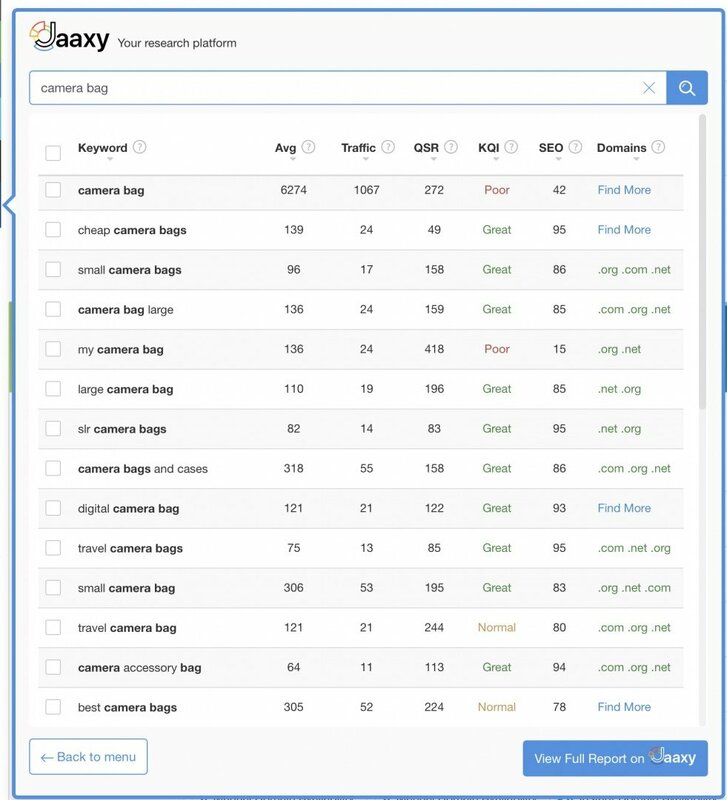 I am excited about future additions to Jaaxy now that you are going to focus on progressing one single well-featured keyword tool, nice one Carson and Kyle, the right thing to do! So, as a current Jaaxy Pro user, I don't see any difference as you mentioned. Do you think it is worth downgrading the Jaaxy Lite and save myself $200? When the cat was let out of the bag, I would have never guessed that this would be Jaaxy, of all things. I was assuming the entire platform was about to take on a whole new look. I am happy with the prices and the fact that there is a free premium member level. As with WA itself, I am grandfathered into the old 2005 pricing which cannot be beat, and it is nice to see you've rolled back the pricing for premium members as well for Jaaxy. I am still here and have made many changes that will better suit running an online business! There's no other way to cut it. Nothing stands like WA anywhere in the industry. It is something that should never be taken for granted. Onboard Jaaxy has connected without any issues and everything in it is as I left it. Yep, never left, just not visible as much. I'm looking forward to it. I have turned the corner and in home stretch now. It took a long time to do this, but worth it. Very happy to see you Alanna. As I get re-settled, I will be a little more active on here. There is much to do. Hi Kyle/Carson. I just tried the new Jaaxy and upgrade to Lite, really easy thanks. But when I go to the SIterank page there is a message there that says "You've got 100 out of 100 scans remaining until Jan 01, 1970". It is not an issue but the date is a little old, lol. Just thought u would like to know. Yeah, we are on this issue. It will be sorted shortly. Thanks for bringing this to our attention. LOL! That's the year I drew a basketball court on my grandmother's carpet with a Magic Marker and got in a heap of trouble! LOL! on that regard, my youngest brother, a few years later, was playing with a lighter behind my father's recliner and set that on fire. Both parents came running - my father with the water, and my mother with the belt. Not really the place to be doing it, but I could not resist when that was the first thing that came up in my mind when I saw the date. Yep, probably the most significant thing during that time for the amount of trouble I got into for it. It was a two-week vacation to Grandma's instantly down to two days! I was 10 years old when I did it - old enough to know better. Got it from my grandmother, then my mother when she drove 100 miles to pick me up and my father when he got home from work that day. Something you never forget. Lol! The joys of growing up! This is an excellent development at the end of the year. I'm looking forward to using Jaaxy later this week. Yes, those still work just fine and you can promote Jaaxy outside of WA. You can also mention to people now that they can get a discount if they are a premium member and access Jaaxy Lite through WA. However you want to promote it and what fits best to your audience, ideally you will get people into WA and they can either use Jaaxy within their membership or upgrade here. Will I lose all my saved searches from the other Keyword tool? Thank you for this surprise!! I am so excited. I was a premium member of Jaaxy the first part of this year. I loved using it. However, when some budget cuts needed to be made, I reluctantly decided to let Jaaxy go. I ended up missing the grandfathered in pricing and simply couldn't justify the higher amounts yet. 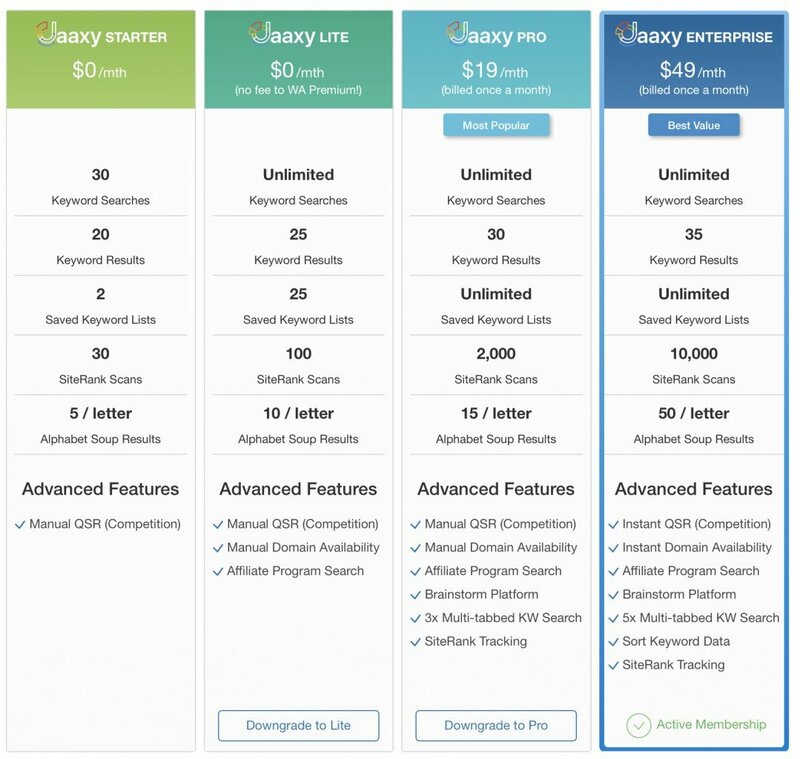 So.....the new pricing structure for Jaaxy is a dream come true. This new WA + Jaaxy combination is certainly going to be a great thing for us as WA members, keyword researchers and affiliate marketers. Thanks!!!! Hey Sondra, one of our goals with integrating Jaaxy into WA List to give premium members a heavy discount so that they could take advantage of the features and functionality of pro an enterprise level accounts. We have worked tirelessly on the upgrade and downgrade flow so I think that you'll find it quite easy to get yourself up and running again with a Jaaxy account, whatever level you choose! THANKS for this awesome upgrade!!! LOVE IT! Carson or Kyle ,It looks like the LITE has 100 Site Rank scans, but when I try to click on "track this keyword" it tells me to upgrade. Does the 100 scans not include auto tracking? It seems like it would since these 100 scans are called "Auto Tracking Scans Left".... also what's up with the old date at the end of that? See image. Should the date be sometime in the future and then it refreshes the 100 for me? Hi Grace, great to hear from you and this is a good question that you've asked. Auto tracking at Jaaxy is available to pro and enterprise-level accounts. You can still use SiteRank in a Jaaxy LITE account, but you cannot set up that tracking to the automatic. Auto tracking allows you to follow the rankings of a domain and keyword, it's incredibly powerful to see how you fluctuate in Google, bing, and Yahoo. So, you can enjoy using site rank to check on your website rankings, however you will need to upgrade if you want to follow the rankings automatically. I hope this makes sense! Oh, in relation to the date, we'll look into this, definitely something strange about that. Just tested it out, it is fantastic. Thanks guys for making every effort to help us on your all in one platform. It's very much appreciated! Some small feedback, when the search is done in mobile and you need to enlarge the screen, the headers on the search dont follow the columns...something to look at again perhaps. Thanks for the feedback Paul, we are going to be releasing our much more friendly mobile version of WA as we move in the new year. Another project we have been quietly working on behind the scenes. You guys and this platform is awesome, thanks again for helping us build our online business here. Having all the tools here in one location is super and certainly makes my life easier.